* The Flame virus discovered to have infected certain Iranian and other computers, can gather data files, remotely change settings on computers, turn on PC microphones to record conversations of nearby persons, take screen shots and log instant messaging chats. This is one of an occasional series of dispatches concerning Iran. Tehran has now admitted that a malicious software program dubbed “Flame” has been found on many of its computers, and Iranian authorities are running an urgent inspection of all computer systems in the country. The virus can turn on computer microphones to record conversations of people nearby, take screenshots, gather data files and remotely change settings on computers. The data it collects is relayed back to the virus’s creators. Research by Russia’s Kaspersky Lab, which announced on Monday that it had discovered Flame, said it is found in its highest concentration in Iranian computers. Kaspersky (which is one of the world’s leading computer virus detection companies) estimated that 189 computers in Iran had been targeted, as well as a number of computers in Israel, the Palestinian territories, Sudan, Syria, Lebanon, Saudi Arabia and Egypt. “This is a large, organized system. It is possible that years were invested in creating it,” experts at Kaspersky said. According to Kaspersky, the virus has been active for as long as five years, but has only been detected now. Evidence also suggests that Flame may have been built on behalf of the same person(s) or nation(s) that commissioned the Stuxnet worm that slowed down Iran’s nuclear program in 2010, according to experts quoted in the Reuters article below. Iran has accused the United States and Israel of being behind Stuxnet. Computer experts said that it was probable that only a nation state would have the capability to build such a sophisticated tool. Last year, The New York Times reported that Stuxnet came from a joint program with an unnamed party begun around 2004 to undermine Iran’s efforts to build a bomb, and had been originally authorized by U.S. President George W. Bush, and then continued by his successor, Barack Obama. Israel’s Deputy Prime Minister (and former IDF chief of staff) Moshe Ya’alon appeared to hint in a radio interview yesterday that Israel is behind the Flame malware that has attacked computers in Iran. Moshe Ya’alon is a subscriber to this email list. Tom Gross adds: Although Israeli security sources say that the Flame virus had a “massive impact on Iran,” and helped to gather “large quantities of information from various Iranian government agencies,” having evaded detection by 43 different anti-virus programs, and was 20 times as large as the Stuxnet computer worm, neither it nor Stuxnet has been sufficient in and of itself to stop the Iranian nuclear weapons program. These apologists will have trouble explaining the latest comments by the chief of staff of the Iranian armed forces. According to Fars, Firouzabadi reminded those present that this was the edict of Iran’s Supreme Leader Ali Khamenei and could not be changed. Former Spanish Prime Minister Aznar also publically revealed earlier this month at a Jerusalem conference that on a visit he made to Iran, “Supreme Leader Khamenei told me that Israel must be burned”. According to the official, the Iranians have succeeded in changing the world’s demands. “In the previous rounds of talks, when Iran was only enriching uranium up to three percent, the world’s demand was for a full halt to enrichment. Now that they are enriching up to 20% there are those in the world saying they are able to accept a certain amount of enrichment,” he said. Israel, the official added, was “skeptical in the extreme” about the current talks, and said the Iranians have bought themselves two months to move their nuclear ambitions forward – five weeks from the first meeting in Istanbul on April 14 to last week’s session in Baghdad, and now another three weeks between that meeting and the next one scheduled for June 19 in Moscow. “They are successfully playing for time,” the official said. Some Western diplomats have also expressed doubts that Iran would abide by any deal granting the IAEA access to sites, people and documents, pointing out that Tehran has stonewalled the agency’s efforts since 2007. Israeli Prime Minister Benjamin Netanyahu urged the international community not to give in to Iran over its nuclear program. Netanyahu said the Islamic Republic wants to destroy Israel, all the evidence was there but many in the West were determined to ignore or downplay it. He added that Iran is a threat to world peace. He urged the international community to show strength in its dealings with Tehran, “not weakness.” There must “no capitulation,” he insisted. Netanyahu said that the international community must call on Iran to halt all enrichment of uranium, must transfer all enriched uranium out of the country, and must dismantle its covertly built underground military facility near Qom. Netanyahu’s comments came as the head of Iran’s nuclear agency announced plans for a second reactor at Bushehr scheduled for completion in the early part of 2014. On Friday, the International Atomic Energy Agency revealed that it has evidence that the Iranians have enriched uranium at the Fordo plant to 27% -- significantly greater than any previous enrichment efforts have yielded. The lead columnist and senior member of the editorial board for the left-wing Israeli paper Ha’aretz (Israel’s equivalent of The New York Times or The Guardian), Ari Shavit, has made a very public and strongly-worded attack on U.S. President Barack Obama’s passivity with respect to Iran. “The man sitting in the Oval Office is ignoring the possibility that his inaction will make the Middle East go nuclear and undermine the world order. He doesn’t care that he might be responsible for losing the United States’ superpower status and turning the 21st century into a century of nuclear chaos. Quite simply, the Iranian nuclear program is proceeding on track according to the wishes of the Iranian leadership. It is based on the dream of reviving the Persian Empire and reinstating its control over the entire region. This agenda is based on territorial and Shi’ite expansionism, digging up the past from its grave in the service of this expansionist policy. This is the prelude to taking over the rest of the region – something that the region’s states and nations should consider a grave danger. Former senior U.S. diplomat Dennis Ross confirmed yesterday that Saudi Arabia’s King Abdullah told the U.S. that if Iran obtains nuclear weapons, Saudi Arabia will do so as well. “If they get nuclear weapons, we will get nuclear weapons,” Abdullah told Ross in April 2009. Ross said he responded to the king’s statement by making a lengthy appeal against allowing there to be nuclear proliferation in the Middle East, but after hearing him out, the king responded by repeating the same line. Iran has recalled its ambassador to Azerbaijan after accusing its neighbour of holding a “gay parade” at last Saturday’s Eurovision Song Contest. This year marked the first time that Azerbaijan had hosted the Eurovision Song Contest – a flamboyant annual pageant of pop music from around Europe and neighboring countries, which is the world’s most watched non-sporting event. A senior Iranian cleric, Ayatollah Sobhani, issued a statement urging Muslims in the region to protest what he described as anti-Islamic behavior by Azerbaijan’s government by hosting the contest. This is the latest in a series of spats between Iran’s Islamic government and Azerbaijan’s secular Muslim one. Iran has accused Azerbaijan of assisting Israel in what it claims was the Jewish state’s assassination of Iranian nuclear scientists. And Azerbaijan has arrested dozens of people on suspicion of links with Iran’s Revolutionary Guards and of plotting attacks on targets that include the Israeli ambassador and U.S. officials in Azerbaijan. About one third of Iranians are ethnically Azeri, and many claim that the whole of southern Azerbaijan is occupied by Iran. On May 17, the “International Day Against Homophobia,” a small group of brave Iranians publicly demonstrated support for gay rights by displaying the gay “rainbow” flag, despite Iran’s extremely tough laws against homosexuality, including a possible death sentence. Please click here to see pictures taken in Tehran. You can see from these pictures, that the individuals have hidden their faces to avoid being identified. The rainbow flag shown in these pictures is the symbol of the lesbian, gay, bisexual, and transgender (LGBT) rights movement, although many Iranians may not know that. The Cannes film festival has dropped from its program an anti-Semitic film by the racist French “comic” performer Dieudonné M’Bala M’Bala. The film, titled “Yahod Setiz” (or “The Anti-Semite”) was produced by the Iranian Documentary and Experimental Film Center. It is said to poke fun at the Nazi death camp Auschwitz, where over 1.5 million Jews were murdered, and stars Dieudonné dressed as a Nazi officer saying Auschwitz was one big party. Robert Faurisson, a French “historian” who has been convicted of Holocaust denial, also briefly appears in the film. A spokesperson for the Cannes festival said that the festival has a policy of banning films that threaten public order or insult religious beliefs, and that Dieudonné’s film clearly violated that policy and should never have been included in the program in the first place. Dieudonne is infamous for performances that deny the Holocaust, praise Hitler, and demonize Jews and people of Jewish origin. He recently announced his candidacy for the French parliament in upcoming elections as a member of the Anti-Zionist Party (Parti Anti-Sioniste, or PAS). I attach two articles below, from Reuters and from Wired magazine. BOSTON (Reuters) - Security experts have discovered a highly sophisticated computer virus in Iran and the Middle East that they believe was deployed at least five years ago to engage in state-sponsored cyber espionage. Evidence suggest that the virus, dubbed Flame, may have been built on behalf of the same nation or nations that commissioned the Stuxnet worm that attacked Iran’s nuclear program in 2010, according to Kaspersky Lab, the Russian cyber security software maker that claimed responsibility for discovering the virus. Kaspersky researchers said on Monday they have yet to determine whether Flame had a specific mission like Stuxnet, and declined to say who they think built it. Iran has accused the United States and Israel of deploying Stuxnet. Cyber security experts said the discovery provides new evidence to the public to show what experts privy to classified information have long known: that nations have been using pieces of malicious computer code as weapons to promote their security interests for several years. “This is one of many, many campaigns that happen all the time and never make it into the public domain,” said Alexander Klimburg, a cyber security expert at the Austrian Institute for International Affairs. A cyber security agency in Iran said on its website on Monday that Flame bore a “close relation” to Stuxnet, the notorious computer worm that attacked that country’s nuclear program in 2010 and is the first publicly known example of a cyber weapon. Iran’s National Computer Emergency Response Team also said Flame might be linked to recent cyber attacks that officials in Tehran have said were responsible for massive data losses on some Iranian computer systems. Kaspersky Lab said it discovered Flame after a U.N. telecommunications agency asked it to analyze data on malicious software across the Middle East in search of the data-wiping virus reported by Iran. Experts at Kaspersky Lab and Hungary’s Laboratory of Cryptography and System Security who have spent weeks studying Flame said they have yet to find any evidence that it can attack infrastructure, delete data or inflict other physical damage. Yet they said they are in the early stages of their investigations and that they may discover other purposes beyond data theft. It took researchers months to determine the key mysteries behind Stuxnet, including the purpose of modules used to attack a uranium enrichment facility at Natanz, Iran. “Their initial research suggest that this was probably written by the authors of Stuxnet for covert intelligence collection,” said John Bumgarner, a cyber warfare expert with the non-profit U.S. Cyber Consequences Unit think tank. Flame appears poised to go down in history as the third major cyber weapon uncovered after Stuxnet and its data-stealing cousin Duqu, named after the Star Wars villain. The Moscow-based company is controlled by Russian malware researcher Eugene Kaspersky. It gained notoriety in cyber weapons research after solving several mysteries surrounding Stuxnet and Duqu. Their research shows the largest number of infected machines are in Iran, followed by Israel and the Palestinian territories, then Sudan and Syria. The virus contains about 20 times as much code as Stuxnet, which caused centrifuges to fail at the Iranian enrichment facility it attacked. It has about 100 times as much code as a typical virus designed to steal financial information, said Kaspersky Lab senior researcher Roel Schouwenberg. Kaspersky Lab said Flame and Stuxnet appear to infect machines by exploiting the same flaw in the Windows operating system and that both viruses employ a similar way of spreading. That means the teams that built Stuxnet and Duqu might have had access to the same technology as the team that built Flame, Schouwenberg said. He said that a nation state would have the capability to build such a sophisticated tool, but declined to comment on which countries might do so. The question of who built flame is sure to become a hot topic in the security community as well as the diplomatic world. There is some controversy over who was behind Stuxnet and Duqu. Some experts suspect the United States and Israel, a view that was laid out in a January 2011 New York Times report that said it came from a joint program begun around 2004 to undermine what they say are Iran’s efforts to build a bomb. That article said the program was originally authorized by U.S. President George W. Bush, and then accelerated by his successor, Barack Obama. A U.S. Defense Department spokesman, David Oten, declined to comment on Flame on Monday. The CIA, the State Department, the National Security Agency, and the U.S. Cyber Command declined to comment. Hungarian researcher Boldizsar Bencsath, whose Laboratory of Cryptography and Systems Security first discovered Duqu, said his analysis shows that Flame may have been active for at least five years and perhaps eight years or more. “The scary thing for me is: if this is what they were capable of five years ago, I can only think what they are developing now,” Mohan Koo, managing director of British-based Dtex Systems cyber security company. Mikko Hypponen, chief research officer for anti-virus software maker F-Secure of Finland, described Flame as the latest of high-profile viruses that show makers of anti-virus software need to improve their performance. A massive, highly sophisticated piece of malware has been newly found infecting systems in Iran and elsewhere and is believed to be part of a well-coordinated, ongoing, state-run cyberespionage operation. The malware, discovered by Russia-based antivirus firm Kaspersky Lab, is an espionage toolkit that has been infecting targeted systems in Iran, Lebanon, Syria, Sudan, the Israeli Occupied Territories and other countries in the Middle East and North Africa for at least two years. Dubbed “Flame” by Kaspersky, the malicious code dwarfs Stuxnet in size — the groundbreaking infrastructure-sabotaging malware that is believed to have wreaked havoc on Iran’s nuclear program in 2009 and 2010. Although Flame has both a different purpose and composition than Stuxnet, and appears to have been written by different programmers, its complexity, the geographic scope of its infections and its behavior indicate strongly that a nation-state is behind Flame, rather than common cyber-criminals — marking it as yet another tool in the growing arsenal of cyberweaponry. The researchers say that Flame may be part of a parallel project created by contractors who were hired by the same nation-state team that was behind Stuxnet and its sister malware, DuQu. Early analysis of Flame by the Lab indicates that it’s designed primarily to spy on the users of infected computers and steal data from them, including documents, recorded conversations and keystrokes. It also opens a backdoor to infected systems to allow the attackers to tweak the toolkit and add new functionality. The malware, which is 20 megabytes when all of its modules are installed, contains multiple libraries, SQLite3 databases, various levels of encryption — some strong, some weak — and 20 plug-ins that can be swapped in and out to provide various functionality for the attackers. It even contains some code that is written in the LUA programming language — an uncommon choice for malware. “It’s pretty fantastic and incredible in complexity,” said Alexander Gostev, chief security expert at Kaspersky Lab. Flame appears to have been operating in the wild as early as March 2010, though it remained undetected by antivirus companies. “It’s a very big chunk of code. Because of that, it’s quite interesting that it stayed undetected for at least two years,” Gostev said. He noted that there are clues that the malware may actually date back to as early as 2007, around the same time period when Stuxnet and DuQu are believed to have been created. Gostev says that because of its size and complexity, complete analysis of the code may take years. Kaspersky discovered the malware about two weeks ago after the United Nations’ International Telecommunications Union asked the Lab to look into reports in April that computers belonging to the Iranian Oil Ministry and the Iranian National Oil Company had been hit with malware that was stealing and deleting information from the systems. The malware was named alternatively in news articles as “Wiper” and “Viper,” a discrepancy that may be due to a translation mixup. Kaspersky researchers searched through their reporting archive, which contains suspicious filenames sent automatically from customer machines so the names can be checked against whitelists of known malware, and found an MD5 hash and filename that appeared to have been deployed only on machines in Iran and other Middle East countries. As the researchers dug further, they found other components infecting machines in the region, which they pieced together as parts of Flame. Kaspersky, however, is currently treating Flame as if it is not connected to Wiper/Viper, and believes it is a separate infection entirely. The researchers dubbed the toolkit “Flame” after the name of a module inside it. Among Flame’s many modules is one that turns on the internal microphone of an infected machine to secretly record conversations that occur either over Skype or in the computer’s near vicinity; a module that turns Bluetooth-enabled computers into a Bluetooth beacon, which scans for other Bluetooth-enabled devices in the vicinity to siphon names and phone numbers from their contacts folder; and a module that grabs and stores frequent screenshots of activity on the machine, such as instant-messaging and e-mail communications, and sends them via a covert SSL channel to the attackers’ command-and-control servers. The malware also has a sniffer component that can scan all of the traffic on an infected machine’s local network and collect usernames and password hashes that are transmitted across the network. The attackers appear to use this component to hijack administrative accounts and gain high-level privileges to other machines and parts of the network. Flame does contain a module named Viper, adding more confusion to the Wiper/Viper issue, but this component is used to transfer stolen data from infected machines to command-and-control servers. News reports out of Iran indicated the Wiper/Viper program that infected the oil ministry was designed to delete large swaths of data from infected systems. Because Flame is so big, it gets loaded to a system in pieces. The machine first gets hit with a 6-megabyte component, which contains about half a dozen other compressed modules inside. The main component extracts, decompresses and decrypts these modules and writes them to various locations on disk. The number of modules in an infection depends on what the attackers want to do on a particular machine. Once the modules are unpacked and loaded, the malware connects to one of about 80 command-and-control domains to deliver information about the infected machine to the attackers and await further instruction from them. The malware contains a hardcoded list of about five domains, but also has an updatable list, to which the attackers can add new domains if these others have been taken down or abandoned. While the malware awaits further instruction, the various modules in it might take screenshots and sniff the network. The screenshot module grabs desktop images every 15 seconds when a high-value communication application is being used, such as instant messaging or Outlook, and once every 60 seconds when other applications are being used. Although the Flame toolkit does not appear to have been written by the same programmers who wrote Stuxnet and DuQu, it does share a few interesting things with Stuxnet. Stuxnet is believed to have been written through a partnership between Israel and the United States, and was first launched in June 2009. It is widely believed to have been designed to sabotage centrifuges used in Iran’s uranium enrichment program. DuQu was an espionage tool discovered on machines in Iran, Sudan, and elsewhere in 2011 that was designed to steal documents and other data from machines. Stuxnet and DuQu appeared to have been built on the same framework, using identical parts and using similar techniques. But Flame doesn’t resemble either of these in framework, design or functionality. Stuxnet and DuQu were made of compact and efficient code that was pared down to its essentials. Flame is 20 megabytes in size, compared to Stuxnet’s 500 kilobytes, and contains a lot of components that are not used by the code by default, but appear to be there to provide the attackers with options to turn on post-installation. One of these is an interesting export function in both Stuxnet and Flame, which may turn out to link the two pieces of malware upon further analysis, Gostev said. The export function allows the malware to be executed on the system. Also, like Stuxnet, Flame has the ability to spread by infecting USB sticks using the autorun and .lnk vulnerabilities that Stuxnet used. It also uses the same print spooler vulnerability that Stuxnet used to spread to computers on a local network. This suggests that the authors of Flame may have had access to the same menu of exploits that the creators of Stuxnet used. Unlike Stuxnet, however, Flame does not replicate automatically. The spreading mechanisms are turned off by default and must be switched on by the attackers before the malware will spread. Once it infects a USB stick inserted into an infected machine, the USB exploit is disabled immediately. This is likely intended to control the spread of the malware and lessen the likelihood that it will be detected. This may be the attackers’ response to the out-of-control spreading that occurred with Stuxnet and accelerated the discovery of that malware. It’s possible the exploits were enabled in early versions of the malware to allow the malware to spread automatically, but were then disabled after Stuxnet went public in July 2010 and after the .lnk and print spooler vulnerabilities were patched. Flame was launched prior to Stuxnet’s discovery, and Microsoft patched the .lnk and print spooler vulnerabilities in August and September 2010. Any malware attempting to use the vulnerabilities now would be detected if the infected machines were running updated versions of antivirus programs. Flame, in fact, checks for the presence of updated versions of these programs on a machine and, based on what it finds, determines if the environment is conducive for using the exploits to spread. The researchers say they don’t know yet how an initial infection of Flame occurs on a machine before it starts spreading. The malware has the ability to infect a fully patched Windows 7 computer, which suggests that there may be a zero-day exploit in the code that the researchers have not yet found. The earliest sign of Flame that Kaspersky found on customer systems is a filename belonging to Flame that popped up on a customer’s machine in Lebanon on Aug. 23, 2010. An internet search on the file’s name showed that security firm Webroot had reported the same filename appearing on a computer in Iran on Mar. 1, 2010. But online searches for the names of other unique files found in Flame show that it may have been in the wild even earlier than this. At least one component of Flame appears to have popped up on machines in Europe on Dec. 5, 2007 and in Dubai on Apr. 28, 2008. Kaspersky estimates that Flame has infected about 1,000 machines. The researchers arrived at this figure by calculating the number of its own customers who have been infected and extrapolating that to estimate the number of infected machines belonging to customers of other antivirus firms. All of the infections of Kaspersky customers appear to have been targeted and show no indication that a specific industry, such as the energy industry, or specific systems, such as industrial control systems, were singled out. Instead, the researchers believe Flame was designed to be an all-purpose tool that so far has infected a wide variety of victims. Among those hit have been individuals, private companies, educational institutions and government-run organizations. Symantec, which has also begun analyzing Flame (which it calls “Flamer”), says the majority of its customers who have been hit by the malware reside in the Palestinian West Bank, Hungary, Iran and Lebanon. They have received additional reports from customer machines in Austria, Russia, Hong Kong, and the United Arab Emirates. Researchers say the compilation date of modules in Flame appear to have been manipulated by the attackers, perhaps in an attempt to thwart researchers from determining when they were created. The malware has no kill date, though the operators have the ability to send a kill module to it if needed. The kill module, named browse32, searches for every trace of the malware on the system, including stored files full of screenshots and data stolen by the malware, and eliminates them, picking up any breadcrumbs that might be left behind. “When the kill module is activated, there’s nothing left whatsoever,” Gostev said. UPDATE PDT: Iran’s Computer Emergency Response Team announced on Monday that it had developed a detector to uncover what it calls the “Flamer” malware on infected machines and delivered it to select organizations at the beginning of May. It has also developed a removal tool for the malware. Kaspersky believes the “Flamer” malware is the same as the Flame malware its researchers analyzed. The latest threat to Iran? The family of a leading Hamas terrorist allegedly killed by an Israeli hit squad, say they will try and block the release of a planned Israeli-French feature film based on his death – not because it portrays him as a terrorist responsible for helping kill hundreds of Israelis, but because it shows him drinking in the hotel bar. The film, which parodies the killing of Hamas commander Mahmoud al-Mabhouh in his five-star hotel room in Dubai in January 2010, stars Israeli supermodel Bar Rafaeli, French actor Tomer Sisley and Israel’s Shlomo Bar-Abba, star of the Oscar-nominated film “Footnote”. “The film undermines the image of our brother, showing him drinking alcohol and meeting in a bar with an Israeli model who seduces him and sets the trap for his assassination,” Fayaq al-Mabhouh told the Gaza bureau of Agence France Presse (AFP) in Gaza. Filming is currently under way in the Red Sea resort of Eilat with the movie due for release next year. Dubai’s police chief claimed Israel’s Mossad spy agency was behind the killing and said there were 33 suspects in total, who used 45 false passports from Britain, Ireland, France, Germany and Australia. Israel has denied involvement, but has nevertheless been criticized by the countries whose passports were allegedly used in the operation. No one has ever been apprehended for the assassination despite Dubai’s release of supposed photos of those involved. Palestine Airways has announced that it plans to resume flights between Amman (Jordan), El-Arish (Egypt) and Jeddah (Saudi Arabia). The tiny airline used to fly regularly, but its last flight was in 2009, carrying Haj pilgrims from Gaza to Saudi Arabia. It is now resuming flights between El-Arish, which is in the northern Sinai, and Amman. The airline only has three aircraft and a staff of about 100, almost all of whom are Palestinian. It was established in 1995, and was based in Gaza until Israel damaged the Gaza airfield, following a wave of suicide bombings against Israeli civilians and threats by Hamas to launch aerial terrorism on Israeli towns from the Gaza airfield. There are unconfirmed Israeli press reports that Mitt Romney, the presumed Republican nominee for U.S. president, is planning a short visit to Israel in the near future. Press commentators speculated that one of Romney’s motives for visiting was to upstage President Barack Obama, who is the first American president in decades not to have visited America’s close ally, Israel, since taking office. By contrast, since assuming the presidency, Obama has visited Arab dictatorships including Egypt and Saudi Arabia, where he was warmly welcomed by the regimes there. Saudi Arabia has banned the use of the Gregorian calendar in all official state and business dealings, the Arabic daily Al Watan reported last weekend. Riyadh’s decree also bars government and private agencies and businesses from using the English language to answer phone calls or to communicate in general. According to the report, all ministries and agencies must use only the Islamic calendar and the Arabic language. Al Watan said the Saudi Interior Ministry believes that some ministries and agencies could “sometimes” use the Gregorian calendar when, for example, coordinating flight schedules with foreign airlines, but only on the condition that it is associated with the corresponding Hijri (Islamic) date. Below are some of the many past dispatches on this list with items about Saudi Arabia – a country which the BBC, New York Times and other major international media rarely report on properly, despite being a key Western ally and major world power. 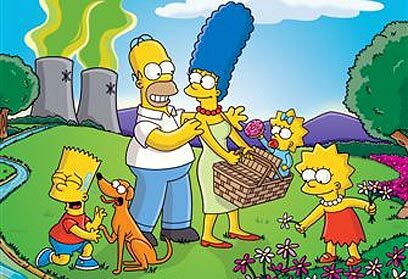 The Associated Press reports that an Iranian government-affiliated agency has banned dolls of cartoon characters from the television show The Simpsons. Barbie and other dolls are already banned. “We do not want to promote this cartoon by importing the toys,” Mohammad Hossein Farjoo, secretary of policymaking at the Institute for the Intellectual Development of Children and Young Adults, told the Shargh daily newspaper. He did not elaborate on what was wrong with The Simpsons specifically. But he noted that any doll or toy with speakers that blare out the voices of Western singers, or toy kitchen sets that include glasses that could in theory be used by the dolls for drinking alcoholic beverages, were banned. However, Farjoo said that dolls of Spiderman and Superman were authorized for sale. “They help oppressed people and they have a positive stance,” he claimed. In January, Iranian police closed down dozens of toy shops for selling Barbie dolls. Despite bans on many books, movies, songs, satellite TV channels, haircuts and clothes from the West, many young Iranians keenly follow Western culture and obtain illegal products on the black market. One-quarter of Iran’s population of 75 million is under 15 years old. Iranian President Mahmoud Ahmadinejad says he would like to attend the 2012 London Olympics after all, to support Iran’s 50 or so athletes who will compete there, but that the British authorities had “problems” with him coming. Iran said last year it might boycott the London Olympics because it believed the event’s logo, which depicts the year 2012 with four jagged figures, resembled the word Zion. Zion is a term that refers to the city of Jerusalem and Iran does not recognize Israel. But Ahmadinejad appears to have changed his mind. “I would like to be among Iranian athletes in the 2012 London Olympics to support them but the host country has problems with that,” the official Iranian IRNA news agency reported him saying. Relations between Iran and Britain remain frosty. Last November, the regime’s plain clothes special units attacked and ransacked the British embassy in Tehran, destroying paintings of Queen Elizabeth II, among other things. In a wide-ranging survey by the leading international polling agency, the Pew Research Center, 63 percent of Americans said they would now be in favor of taking military action to prevent Iran from acquiring nuclear weapons. A slim majority of Germans, British and French said they would also be in favor of taking military action, should sanctions fail. The Pew Research Center asked 26,210 people in 21 different countries to give their views on Iran’s alleged plans to build nuclear weapons, and found widespread opposition to Iran’s aims in all 21 countries, including Russia, China, and Lebanon. The Iranian regime says all of its nuclear activities are for peaceful purposes, but no one inside or outside Iran believes them -- apart from a few apologists for the regime in western academia. * Hath not an Israeli actor eyes? Does he not bleed? 6. Was al-Megrahi in effect the 271st victim of the Lockerbie bomb? 7. Hath not an Israeli actor eyes? Does he not bleed? Salameh Kaileh, 56, a prominent Palestinian writer who was jailed in Syria for just under three weeks from April 24, described the detention facilities there as “human slaughterhouses” in an interview with the Associated Press. “I felt I was going to die under the brutal, savage and continuous beating of the interrogators, who tied me to ropes hung from the ceiling,” said Kaileh. He said security agents beat detainees with batons, crammed them into stinking cells and tied them to beds at night. “It was hell on earth,” Kaileh said after being released and deported to Jordan. He had bluish-red bruises on his legs, which he said were the result of beatings with wooden batons that were studded with pins and nails. The leading Arabic language satellite broadcaster Al Arabiya reported yesterday that Syrian officials said that Deputy Minister of Defense Assef Shawkat, 62, was killed in an attack by the Free Syrian Army near Damascus. Shawkat is also President Bashar Assad’s brother-in-law and a former head of military intelligence. Al Arabiya said Assad and his wife Asma visited a Damascus Hospital on Monday where Shawkat was receiving treatment before succumbing to his wounds. Despite Bahrain’s continuing bloody crackdown on pro-democracy protestors, the Obama administration has announced that it would be resuming arms sales to the Gulf dictatorship. They suspended them last October after the Sunni-led Bahraini regime continued its suppression of peaceful demonstrators from the downtrodden majority Shia population. The U.S. State Department sent a notification to Congress that the items were for maintaining Bahrain’s “external defense capabilities,” and that it would still hold back on the delivery of military supplies used for “crowd control”. Over 100 people have been killed and thousands injured and tortured since the uprising by Bahrain’s marginalized and often impoverished native Shia majority against the ruling Sunni elite began in February 2011. Bahrain has invited in Saudi special forces to help suppress the protests. Clashes are continuing daily. Every night dozens of injured people find refuge in a network of private homes, where they are treated for gunshot and other wounds in secret medical clinics set up there. As is the case in Syria, doctors risk lengthy prison terms for treating the injured in hospitals. Bahrain is home to the U.S. Fifth Fleet and the naval headquarters for Central Command. Queen Elizabeth II hosted a number of dictators at her Diamond Jubilee celebrations last Friday treating them to lunch at Windsor Castle and then dinner at Buckingham Palace. Among the tyrants she hosted were the leaders of Bahrain, Brunei, Kuwait, Oman, Qatar, Saudi Arabia, Swaziland and the United Arab Emirates. They preside over regimes with some of the worst human rights records in the world. They detain high numbers of political prisoners who are tortured and subjected to other abuses, and they practice gross discrimination against women, homosexuals, minority faiths, and often severely ill-treat foreign guest workers. On the advice of the British Foreign office (ministry) her Majesty has made over 250 official overseas visits to 129 countries during her 60-year reign, but neither she nor any British royal has ever officially set foot in one particular country: Israel. To the best of my knowledge the head of state of every other country in Europe has visited Israel at some point. Harun Yusuf Zindani, 50, a Jewish community leader in Yemen, was stabbed to death at a market in the capital Sana’a yesterday by a Muslim assailant who accused him of “not believing in Allah”. Less than 300 Jews remain in the country, once home to a flourishing 2000 year Jewish community of close to 100,000. Most Yemenite Jews moved to Israel as soon as the Jewish state was created but a handful opted to stay and look after the synagogue and other communal property. Zindani’s son Yehya said his father received stab wounds to his neck and stomach and later died in hospital. WAS AL-MEGRAHI IN EFFECT THE 271st VICTIM OF THE LOCKERBIE BOMB? As readers will no doubt have heard by now, the only man convicted of the Lockerbie bombing, Abdelbaset Al-Megrahi, died in the Libyan capital Tripoli on Sunday. The bombing four days before Christmas in 1988 of a Pan Am London-to-New York air flight above the small Scottish town of Lockerbie, killed 270 people, including eleven on the ground. Al-Megrahi was convicted by a special court in the Netherlands in 2001. He volunteered to go the court, he said, “to once and for all prove my innocence”. He was found guilty but then freed from a Scottish jail in 2009 on compassionate grounds after being diagnosed with terminal cancer and given only a few months to live. While many of the relatives of the victims of the Lockerbie bombing greeted his release with fury, others welcomed it. Together with a number of respected legal and anti-terrorism experts they believe that al-Megrahi, a Libyan intelligence officer, who always denied any involvement in the bombing, was innocent, and that most of the evidence points to a Syrian-backed PLO splinter group (the PFLP) having carried out the attack in return for payment by Iran. Iran was said to be seeking revenge for the accidental downing of an Iranian passenger jet by America some months earlier. Britain and America, they believe, didn’t want to point the finger of blame at the regimes in Syria and Iran in the run-up to the 1990 war to liberate Kuwait after it was invaded by Saddam Hussein’s Iraq. The western countries thought they needed the cooperation of the Assad regime in their efforts and therefore instead scapegoated Colonel Gaddafi’s Libya (which had definitely been responsible for other acts of terrorism). One relative of an American victim of the Lockerbie bomb said after al-Megrahi died on Sunday that al-Megrahi was in effect “the 271st victim of the Lockerbie bomb”. HATH NOT AN ISRAELI ACTOR EYES? DOES HE NOT BLEED? This is a follow-up to this dispatch. As I noted before, among those singling out Israel as the only country unworthy of performing Shakespeare are the two-time Oscar winner Emma Thompson. She and her fellow objectors have no qualms about the National Theatre of China performing “Richard III” in Mandarin at the same festival, or the Palestinian Ashtar Theatre company performing “Richard II” in Arabic there. Nor do they care that the Globe Shakespeare festival will host Iranian, Russian and Turkish theater groups. They seem unconcerned by women getting stoned or being raped in Iranian jails, or by the Russian occupation of Chechnya, or the Turkish occupation of northern Cyprus and Kurdistan. Incidentally, my late father John Gross wrote an award-winning book on the uses and misuses of the character Shylock, and this latest act of prejudice and attempted exclusion in London might have made an interesting footnote to it. The book discusses reactions to and writings on Shylock from people as diverse as Heine, Proust, Joyce, Marx and Hitler – who made great use of the play, staging grotesque performances in Germany and Austria to whip up anti-Semitism. It is published in America under the title “Shylock: A Legend and Its Legacy” and in Britain as “Shylock: Four Hundred Years in the Life of a Legend”. My father notes that Habima – the theatre company originally founded in Moscow before Stalin banned it and which first toured Britain in 1926 – first performed The Merchant of Venice in Tel Aviv in 1936. In advance of your visit to Shakespeare’s Globe to see Merchant of Venice on Monday 28 or Tuesday 29 May we are writing to advise you of conditions of entry we have in place for these performances. We will have enhanced security processes in place on the date of your visit including extensive checks of bags and audience members. The site will be open at 6pm and we strongly advise you arrive at this time to avoid a delayed start of the performance. If the majority of the audience arrive after 7pm the show will be significantly delayed. All entry to the theatre will be via the New Globe Walk entrance, including standing tickets. The groundling queue will be formed on the theatre piazza instead of the groundling gates entrance. We advise you not to bring bags with you and to only bring items essential to your theatre visit. No professional filming or photography equipment will be permitted onsite. We will be operating a free left luggage service which all bags/luggage exceeding 20cm x 15cm x 10cm will need to be checked into. Please be aware that the Globe reserves the right to refuse admission to anyone we have reason to believe may cause a disruption to the performance. Any objects or material which could be used in disrupting the performance will be deemed prohibited items. Any individuals who attempt to disrupt the performance will be asked to leave the theatre. Both of the performances are sold out and therefore the Box Office will be closed on the evenings of the performance. Please ensure you have collected your tickets in advance of 4pm on the day of the performance. Israel’s national bird, the hoopoe: A symbol of racism! These are extraordinary times in the history of freedom. In the Arab Spring, we have seen the broadest challenge to authoritarian rule since the collapse of Soviet communism. The idea that Arab peoples are somehow content with oppression has been discredited forever. Yet we have also seen instability, uncertainty and the revenge of brutal rulers. The collapse of an old order can unleash resentments and power struggles that a new order is not yet prepared to handle. Some in both parties in Washington look at the risks inherent in democratic change – particularly in the Middle East and North Africa – and find the dangers too great. America, they argue, should be content with supporting the flawed leaders they know in the name of stability. But in the long run, this foreign policy approach is not realistic. It is not within the power of America to indefinitely preserve the old order, which is inherently unstable. Oppressive governments distrust the diffusion of choice and power, choking off the best source of national prosperity and success. This is the inbuilt crisis of tyranny. It fears and fights the very human attributes that make a nation great: creativity, enterprise and responsibility. Dictators can maintain power for a time by feeding resentments toward enemies – internal or external, real or imagined. But eventually, in societies of scarcity and mediocrity, their failure becomes evident. America does not get to choose if a freedom revolution should begin or end in the Middle East or elsewhere. It only gets to choose what side it is on. The day when a dictator falls or yields to a democratic movement is glorious. The years of transition that follow can be difficult. People forget that this was true in Central Europe, where democratic institutions and attitudes did not spring up overnight. From time to time, there has been corruption, backsliding and nostalgia for the communist past. Essential economic reforms have sometimes proved painful and unpopular. It takes courage to ignite a freedom revolution. But it also takes courage to secure a freedom revolution through structural reform. And both types of bravery deserve our support. This is now the challenge in parts of North Africa and the Middle East. After the euphoria, nations must deal with questions of tremendous complexity: What effect will majority rule have on the rights of women and religious minorities? How can militias be incorporated into a national army? What should be the relationship between a central government and regional authorities? Problems once kept submerged by force must now be resolved by politics and consensus. But political institutions and traditions are often weak. We know the problems. But there is a source of hope. The people of North Africa and the Middle East now realize that their leaders are not invincible. Citizens of the region have developed habits of dissent and expectations of economic performance. Future rulers who ignore those expectations – who try returning to oppression and blame shifting – may find an accountability of their own. As Americans, our goal should be to help reformers turn the end of tyranny into durable, accountable civic structures. Emerging democracies need strong constitutions, political parties committed to pluralism, and free elections. Free societies depend upon the rule of law and property rights, and they require hopeful economies, drawn into open world markets. This work will require patience, creativity and active American leadership. It will involve the strengthening of civil society – with a particular emphasis on the role of women. It will require a consistent defense of religious liberty. It will mean the encouragement of development, education and health, as well as trade and foreign investment. There will certainly be setbacks. But if America does not support the advance of democratic institutions and values, who will? In promoting freedom, our methods should be flexible. Change comes at different paces in different places. Yet flexibility does not mean ambiguity. The same principles must apply to all nations. As a country embraces freedom, it finds economic and social progress. Only when a government treats its people with dignity does a nation fulfill its greatness. And when a government violates the rights of a citizen, it dishonors an entire nation. There is nothing easy about the achievement of freedom. In America, we know something about the difficulty of protecting minorities, of building a national army, of defining the relationship between the central government and regional authorities – because we faced all of those challenges on the day of our independence. And they nearly tore us apart. It took many decades of struggle to live up to our own ideals. But we never ceased believing in the power of those ideals – and we should not today. Tom Gross notes: The article below from The Guardian is notable because the word “terrorism” is used. 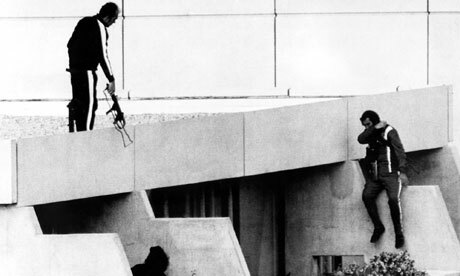 In recent years some other media (including other articles in The Guardian) have stopped calling the Munich Olympic Massacre an act of terrorism, although it clearly was. However, the article below appeared in the paper’s sports pages, which are more neutral -- and accurate -- than the news pages. The International Olympic Committee has rejected an Israeli call for a minute’s silence at the London Games to mark the 40th anniversary of the Munich terrorist attack in which 11 Israeli athletes were killed. A letter from the committee’s president, Jacques Rogge, on Monday ignored a specific request for a minute’s silence, saying only that he would attend a commemoration of the 1972 attack at London’s Guildhall and that the IOC would be represented at any event organised by Israel. “The IOC has officially paid tribute to the memory of the athletes on several occasions,” Rogge wrote. He said that “within the Olympic family, the memory of the victims of the terrible massacre in Munich in 1972 will never fade away”. The request, in support of a campaign by two widows of victims of the Munich attack, was sent last month by the Israeli deputy foreign minister, Danny Ayalon. A minute’s silence, he wrote, would “send a clear message that we must not forget the terrible events of Munich 40 years ago so they will not be repeated”. The IOC’s response was “a polite but very clear rejection”, said Yigal Palmor, a spokesman for the Israeli foreign ministry. “It’s a shame. The IOC is treating this as an internal Israeli matter but [the Munich massacre] is of concern to the whole Olympic family, it was an onslaught on the whole Olympic ideal. A spokesman for the IOC said it had worked closely with the Israeli National Olympic Committee on a ceremony at London’s Guildhall that was “the most appropriate” way of commemorating the Munich attack. An event to mark the massacre was held at every games, he added. The Munich attack began in the early hours of 5 September 1972, when eight members of the Palestinian military organisation Black September infiltrated the Olympic village, and took 11 members of the Israeli team hostage. The attackers demanded the release of 234 Palestinian prisoners in return for the hostages’ release. By just after midnight, all 11 athletes, five attackers and a German police officer were dead. Although the hostage drama gripped television viewers across the world, the Games were suspended only for a few hours at the height of the crisis and resumed the next morning. A commemorative ceremony organised by the Israeli National Olympic Committee will be held at the London Games as it has in previous years. LONDON – Anti-Israel activists sharply criticized the socialist British daily the Morning Star for referring to Israel’s national bird the hoopoe in its daily quiz. “Maybe you don’t support the methods chosen by the international solidarity movement of BDS [boycott, divestment and sanctions against Israel] to assist the Palestinians in their struggle for freedom and justice,” she said, adding that this included any reference to Israel’s wildlife. “Despite its condemnation of zionists [sic] it yet finds space to include an item in its daily quiz about Israel’s national bird. Is the Star not aware there’s a cultural boycott going on?” Claire’s husband, George Abendstern, asked in another letter. “And then, despite it’s [sic] condemnation of the Bahrain Grand Prix and rightly so, it then goes on to tell us who won. For goodness sake comrades, get your act together,” Abendstern continued. Blackwell’s bookstore in the Manchester city center was set to host a launch of the biography Leila Khaled: Icon of Palestinian Liberation, written by Sarah Irving, a Manchester-based journalist who has written for The Guardian. Paul Thornton, the manager of the store, said they had a large number of calls about the event, which led to some concerns. “There were a number of concerns raised which we wanted to investigate and we have put the event on hold. We did not receive any threats but the number of emails and calls we received meant we couldn’t really run the shop,” he said on Wednesday. Writing on her blog, Irving said: “It is, of course, a measure of the desperate rearguard action which apologists for the actions of the State of Israel are currently fighting that they feel the need to close down all debate and discussion of issues around Palestinian history, politics and culture. If we are to fully understand the Israel-Arab conflict, the memory of these people and their exodus must be acknowledged – not as a political weapon, a negotiating tactic or as part of a competition about who suffered more, but simply as history without which it is impossible to understand Israel and the way the Arab world sees it. Of the 20 families in my fairly average Jerusalem apartment building, half are in Israel because of the Arab expulsion of Jews, and that is representative of Israel as a whole. According to the Israeli demographer Sergio dellaPergola of Hebrew University, though intermarriage over two or three generations has muddled the statistics, roughly half of the 6 million Jews in Israel today came from the Muslim world or are descended from people who did. Many Arabs, and many Israelis, consider Israel a Western enclave in the Middle East. But these numbers do not support that view. These Jews have shaped Israel and are a key force in the country’s political life. They also make Israel very different from the American Jewish community, which is overwhelmingly rooted in Europe. They are a pillar of Israel’s right wing, particularly of the Likud party. They maintain a wary view of Israel’s neighbors – a view that has been strengthened by the actions of the Palestinians but that is rooted in their own historical experience and in what might be considered an instinctive understanding of the region’s unkind realities. Israel is not as foreign to the Middle East as many of its neighbors like to pretend, and more than one native community was displaced in 1948. If many in the Arab world insist, as they do each Nakba Day, that Israel is a Western invader that must be repelled, it is a claim that belongs to the realm not only of politics but of psychology – one that helps repress their own knowledge that the country they try to portray as alien is also the vengeful ghost of the neighbors they wronged. Tom Gross adds: There has been much discussion about the story below on media such as the BBC – but almost no report has mentioned that the suit was an Israeli invention, designed to help the victims of terrorism. The article below does – although it was published in the more “neutral” sports pages, not the news pages. 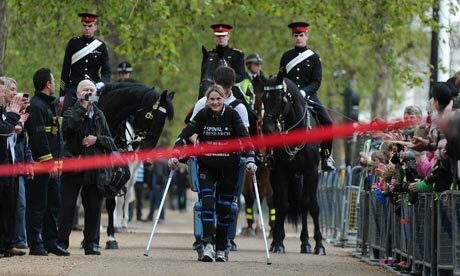 Claire Lomas approaches the London Marathon finishing line in her ReWalk bionic suit. A paralysed woman has become the first person to complete a marathon in a bionic suit. Claire Lomas finished the London Marathon 16 days after the race began. The 32-year-old said she was “over the moon” as she completed the 26.2-mile route, which she started on 22 April with 36,000 other participants. The former chiropractor was in tears as she became the first person to complete any marathon using a bionic ReWalk suit at 12.50pm on Tuesday. Hundreds lined the streets as she made her final steps to complete the race. Three mounted members of the Household Cavalry gave her a guard of honour as she crossed the finishing line on the Mall. Lomas, a jewellery designer who was left paralysed from the chest down following a horse-riding accident in 2007, said: “There were times when I questioned whether I would make it when I was training. A spokeswoman for the mounted regiment said the riders were there to give Lomas “extra support because she is passionate about horses”. Lomas will not appear in the official results and did not receive a medal when she finished as competitors have to complete the course on the same day to qualify for a medal, organisers said. But a number of marathon runners decided to donate their own medals to Lomas. Jacqui Rose, from Southampton, who contributed her medal along with about 12 others, said: “She has epitomised what I thought the London Marathon was all about. “That medal, when you have completed it and gone through all the pain of it, symbolises that achievement of what you have gone out of your way to do for charity. Holly Branson, daughter of the tycoon Richard – whose company Virgin sponsors the race – was at the finish line waiting to give Lomas the Virgin trophy for endurance. The company hands out the award annually. Lomas, from Eye Kettleby, near Melton Mowbray, Leicestershire, raised more than £86,000 for Spinal Research, a charity which funds medical research around the world to develop reliable treatments for paralysis caused by a broken back or neck. She said: “When I was in hospital I saw a lot of people with similar injuries to me and a lot worse. She walked about two miles a day, cheered on by her husband, Dan, her parents and her 13-month-old daughter, Maisie. A number of celebrities have also lent their support by walking a mile alongside her, including the TV presenter Gabby Logan and her husband, the former international rugby star Kenny, and the TV presenter and adventurer Ben Fogle. Lomas broke her neck, back and ribs and punctured a lung when her horse Rolled Oats threw her off as she took part in the Osberton horse trials in Nottinghamshire in 2007. The £43,000 ReWalk suit, designed by the Israeli entrepreneur Amit Goffer, enables people with lower-limb paralysis to stand, walk and climb stairs through motion sensors and an onboard computer system. A shift in the wearer’s balance, indicating their desire to take, for example, a step forward, triggers the suit to mimic the response that the joints would have if they were not paralysed. Following-up the note about Israel’s new government in the dispatch earlier in the week (Netanyahu’s “political masterstroke” (& Gaza restaurant allows female waitress), attached below are two articles about it from the Washington Post’s Charles Krauthammer, and Yossi Klein Halevi, writing in Foreign Affairs. (Both are subscribers to this email list.) Before that are three other notes. Peter David, the Washington bureau chief of The Economist and before that, from 2001-09, The Economist’s foreign editor, tragically died in a car crash in the American state of Virginia on Thursday night. Peter was in many ways an exceptional journalist, and always lively company and a pleasure to talk to. He was for many years a subscriber to this email list and while he said he didn’t always agree with me (especially when I criticized The Economist) he said he made sure to read all these dispatches and was glad that the views in them were being aired. Before taking up the job of foreign editor Peter was a writer on the Middle East for The Economist. He retained a keen interest in the region and just last weekend at The Washington Institute’s annual conference Peter gave an interesting talk on Syria. He was also among the last journalists to interview Yasser Arafat in his compound in Ramallah. Peter David was 60. The driver of the other car has been charged with reckless driving. Peter was the only casualty in the accident. His wife Celia, who was also in the car and was injured, is being released from hospital today. He remained an active supporter of Israel. In the early 1980s he co-founded The Vidal Sassoon Center for the Study of Anti-Semitism at Jerusalem’s Hebrew University with Professor Yehuda Bauer (who is one of the world’s leading Holocaust historians) and traveled there regularly. The Guardian’s obituary said he was a “militant Zionist”. Another British paper, The Daily Telegraph, called him an “anti-fascist warrior-hairdresser”. 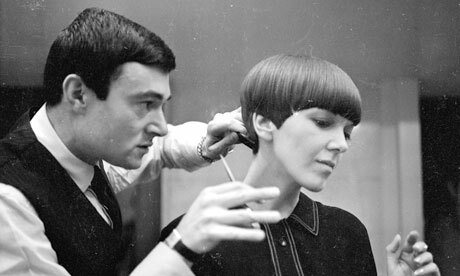 Sassoon began his career as a teenager at Cohen’s Beauty and Barber Shop in London’s working class East End and went on to capture the attention of the fashion world in 1963 when he crafted an architectural haircut for Mary Quant, then one of London’s leading young fashion designers who is credited with inventing the miniskirt. Flown in from London, Sassoon then trimmed the tresses of Mia Farrow in Hollywood for her role in the film “Rosemary’s Baby” – a $30 haircut that he calculated cost $5,000, including the airfare. The 1967 event was staged inside a makeshift “salon” in a boxing ring. The film’s director, Roman Polanski, looked on as Sassoon gave the actress a pixie cut that would be copied by women the world over. Muslim reformist thinker Irshad Manji was attacked by Islamic fundamentalists wielding iron bars and sticks in Jakarta, Indonesia this week. Irshad (who is a longtime subscriber to this email list) was presenting her latest book “Allah, Liberty and Love” – which has been translated into Indonesian – at an event in Yogyakarta, when the building was stormed by masked Islamic extremists. A group of women activists who attended the discussion formed a human cordon around Irshad, protecting her from the worst of the blows. However, her assistant was rushed to hospital with head injuries, having been hit with iron bars. WHY DID THE HIGH-FLYING NETANYAHU CALL OFF ELECTIONS HE WAS SURE TO WIN? In May 1967, in brazen violation of previous truce agreements, Egypt ordered U.N. peacekeepers out of the Sinai, marched 120,000 troops to the Israeli border, blockaded the Straits of Tiran (Israel’s southern outlet to the world’s oceans), abruptly signed a military pact with Jordan and, together with Syria, pledged war for the final destruction of Israel. May ‘67 was Israel’s most fearful, desperate month. The country was surrounded and alone. Previous great-power guarantees proved worthless. A plan to test the blockade with a Western flotilla failed for lack of participants. Time was running out. Forced into mass mobilization in order to protect against invasion – and with a military consisting overwhelmingly of civilian reservists – life ground to a halt. The country was dying. On June 5, Israel launched a preemptive strike on the Egyptian air force, then proceeded to lightning victories on three fronts. The Six-Day War is legend, but less remembered is that, four days earlier, the nationalist opposition (Menachem Begin’s Likud precursor) was for the first time ever brought into the government, creating an emergency national-unity coalition. Everyone understood why. You do not undertake a supremely risky preemptive war without the full participation of a broad coalition representing a national consensus. Forty-five years later, in the middle of the night of May 7-8, 2012, Prime Minister Benjamin Netanyahu shocked his country by bringing the main opposition party, Kadima, into a national unity government. Shocking because just hours earlier, the Knesset was expediting a bill to call early elections in September. Because for Israelis today, it is May ‘67. The dread is not quite as acute: The mood is not despair, just foreboding. Time is running out, but not quite as fast. War is not four days away, but it looms. Israelis today face the greatest threat to their existence – nuclear weapons in the hands of apocalyptic mullahs publicly pledged to Israel’s annihilation – since May ‘67. The world is again telling Israelis to do nothing as it looks for a way out. But if such a way is not found – as in ‘67 – Israelis know that they will once again have to defend themselves, by themselves. To be sure, Netanyahu and Kadima’s Shaul Mofaz offered more prosaic reasons for their merger: to mandate national service for now exempt ultra- Orthodox youth, to change the election law to reduce the disproportionate influence of minor parties and to seek negotiations with the Palestinians. But Netanyahu, the first Likud prime minister to recognize Palestinian statehood, did not need Kadima for him to enter peace talks. For two years he’s been waiting for Mahmoud Abbas to show up at the table. Abbas hasn’t. And won’t. Nothing will change on that front. Those counseling Israeli submission, resignation or just endless patience can no longer dismiss Israel’s tough stance as the work of irredeemable right-wingers. Not with a government now representing 78 percent of the country. Netanyahu forfeited September elections that would have given him four more years in power. He chose instead to form a national coalition that guarantees 18 months of stability – 18 months during which, if the world does not act (whether by diplomacy or otherwise) to stop Iran, Israel will. And it will not be the work of one man, one party or one ideological faction. As in 1967, it will be the work of a nation. In forming a vast new coalition government earlier this week – which now includes the centrist party, Kadima, in addition to right-wing factions – Israeli Prime Minister Benjamin Netanyahu has one overriding purpose: to strengthen his hand on Iran. He now has uncontested political legitimacy with which to pressure the United States against protracted negotiations with Iran and to continue threatening a preemptive attack of his own. Yet although Netanyahu cares most about stopping the Iranian nuclear program, the immediate impetus for the unity government was domestic: a call for electoral reform and ending the exemption of ultra-Orthodox seminary students from serving in the military. Even as Netanyahu forms the expanded coalition to advance his position on Iran, he cannot ignore these internal issues – a sign that the Israeli electorate increasingly demands that its leaders address foreign and domestic concerns simultaneously. The unity deal is Netanyahu’s attempt to reiterate to the United States his resolve to stop Iran from acquiring atomic weapons. In March, when U.S. President Barack Obama attempted to reassure Israel that he would not allow Iran to become a nuclear power by declaring that “the United States will always have Israel’s back,” Jerusalem essentially responded, “No thanks.” Israelis will not entrust their security to any outsider, even a friend. They recall that weeks before the 1967 Six-Day War, U.S. President Lyndon Johnson, as good a friend as Israel has had in the White House, refused an Israeli request to lead an international flotilla to open the Straits of Tiran, which Egypt had shut to Israeli shipping – even though Washington had promised to do precisely that in return for an Israeli withdrawal from Sinai following the 1956 Suez War. After Johnson’s refusal, Israel launched a successful preemptive strike against Egypt. In creating a resilient government, Netanyahu has, in effect, put Obama’s diplomatic initiative with Iran on probation. If negotiations fail to produce tangible results soon, or if, as Israeli policymakers fear, Obama is prepared to allow Iran to reach breakout capacity without actually producing a bomb, Israel is better positioned to strike alone. The coalition has also strengthened Netanyahu’s policy toward the Palestinians. Although Netanyahu suggested that the new government would make advancing the peace process one of its top objectives, negotiations will likely remain stalled. Even if Netanyahu were to impose another settlement freeze, as he did in 2009, no Israeli government, let alone this one, would stop building in Jewish neighborhoods in East Jerusalem – a Palestinian precondition for resuming peace talks. And little public pressure exists to resume the process. Even many Israelis who oppose Netanyahu agree that blame for the lack of progress hardly belongs to Israel alone. Most Israelis – around 70 percent, according to repeated polls conducted by the Truman Institute for the Advancement of Peace – support a two-state solution. But that same majority, those polls reveal, doubts the possibility of an agreement in the near future and questions whether any territorial concessions will win Israel real peace and legitimacy. That is one reason that, in six weeks of anti-government social protests last summer led by young liberal activists, the peace process went unmentioned. And now, given the uncertainty of relations with Egypt, with whom Israel shares its only successful land-for-peace agreement, Israelis are hardly prepared to risk another territorial withdrawal, especially from territories that border Tel Aviv and Jerusalem. Much of the international community has profoundly misread the attitude of the Israeli public toward the occupation and peace. Contrary to what many foreign commentators have suggested, the Israeli mainstream has not accepted the status quo with smug indifference. Instead, most Israelis keenly understand the long-term dangers posed by the occupation to Israel’s international standing and to its ability to remain both a Jewish and a democratic state. All major Israeli parties now accept a two-state solution. Twenty years ago, the Labor Party opposed a Palestinian state in the West Bank and Gaza; today, even Yisrael Beiteinu, the party of right-wing Foreign Minister Avigdor Lieberman, accepts the principle of Palestinian statehood. In endorsing the idea of two states for two peoples, Netanyahu negated a core ideological principle of the Likud, and has helped transform the debate over the territories from an ideological to a pragmatic issue: Under what conditions can Israel withdraw in relative safety? For many supporters, Netanyahu offers the best reassurance of protecting vital Israeli security interests in any future withdrawal. Netanyahu now has over three-quarters of the Knesset in his government. When the prime minister founded his government three years ago, he hoped to create a unity coalition. But he failed in efforts to include Kadima, and although he did bring in Labor, it eventually quit. (A small breakaway faction, led by Defense Minister Ehud Barak, remained.) Still, he did exclude the Knesset’s most right-wing party, the National Union, which supports the most militant settlers. And with this new coalition, Netanyahu can credibly claim to represent the broad Israeli center. Although the new unity government will allow Netanyahu to focus on Iran, it will also force him to address critical domestic issues. For the first time, the political system is positioned to deal with long-standing structural and ideological distortions that threaten the cohesion of Israeli society. Foremost among those is the wholesale exemption of thousands of ultra-Orthodox seminary students from the military draft – a separatism that is, thanks to coalition politics, subsidized by the Israeli mainstream. Along with ending the mass exemptions, this coalition will need to reform the electoral system to prevent the ultra-Orthodox minority from continuing to dictate terms to every coalition. The new government will aim to implement a system of universal conscription that will allow the ultra-Orthodox to perform alternative national service instead of joining the military. This has significant implications for another community outside the mainstream – Israel’s 1.2 million Arab Israelis. Aside from the Druze, a minority Islamic sect, Arab Israelis are exempt from the draft. Yet some form of national service is essential in strengthening the Arab case for equality in a society whose Jewish men devote three years to the nation’s defense and then continue in reserve duty into their forties. Initial polls suggest that the Israeli public largely doubts that the new coalition will change the electoral system or enact universal conscription. Given the cynical nature of Israeli politics, the skepticism is understandable. But this time it may be wrong. Mofaz knows that his political future depends on showing results. And Netanyahu understands that if he fails to exploit the historic opportunity for change that he has created, he will face the public’s harsh judgment. Still, with the issue of Iran pressing, time is not on the government’s side. Domestic change must begin quickly. And given that Netanyahu prefers to negotiate with ultra-Orthodox leaders and establish a gradual transition to conscription, that process has to start before potential security emergencies intervene and sideline internal affairs. Whether or not Netanyahu can solve these problems, the fact that he cannot ignore them, even at this fateful moment with Iran, indicates a profound transformation of Israeli politics. Israelis are no longer willing to defer domestic change. Ironically, the more daunting Israel’s external threats, the more the public has turned inward. That is an expression of Israeli pragmatism: since the average Israeli believes that he personally cannot affect developments in the region, then better focus on problems closer at hand. Zionism once promised that Israel would become an equal, accepted member of the community of nations. Besieged and embattled, it is hardly that. But Zionism did fulfill one pledge: to teach Jews how to defend themselves. For now, at least, self-defense from existential threat defines Israeli politics. Yet as even this coalition of national emergency proves, Israel’s leaders can no longer ignore the longing of their people for a politics of normalcy. In what has been described by some as a “political masterstroke,” Israeli Prime Minister Benjamin Netanyahu late last night canceled the proposed early elections on September 4 and announced that he had formed a national unity government with the centrist Kadima party. The new coalition will comprise 94 of the 120 Knesset members – the largest and potentially most stable government in Israel’s history. Sources in the Prime Minister’s office say Netanyahu is now in a position to advance issues on which there is wide public consensus, such as reform of the electoral system, some territorial compromise with the Palestinians, and curtailing some of the powers of ultra-orthodox Jews – as well as dealing with the Iranian issue and counteracting President Obama’s pressure on Israel (which is expected to be increased should Obama be reelected) with a near united front in Israel. Kadima is headed by Shaul Mofaz, who will assume the position of deputy Prime Minister in the government. Last month, Mofaz was elected to replace Tzipi Livni as head of Kadima, the largest party in the Knesset. Livni was regarded by many as a failure, both as head of Kadima and as opposition leader. Mofaz’s move keeps Kadima in the spotlight. Had early elections been called the party would almost certainly have lost many seats to a resurgent Labor party and a new centrist party headed by former TV host Yair Lapid. As a result, the next Israeli elections will likely be held, as planned, in October 2013. Some commentators in Israel are speculating that Prime Minister Netanyahu has formed a national unity government so he will be free to deal with the threat posed by Iran’s nuclear program this September or October, before the American elections at the start of November. In an interview last weekend with the newspaper Israel Hayom, Israeli Defense Minister Barak again said that confronting Iran before it achieves a nuclear weapons capability, however difficult, will be far less complex than dealing with Iran – and with its client militia Hamas and Hizbullah, who now possess over 150,000 rocket aimed at Israel from Lebanon in the north and Gaza in the south – once Iran has a nuclear capability. Other Israelis have said that the Jewish state cannot trust the world to save it, pointing to the reluctance of any country to help stem the ongoing slaughter in neighboring Syria, beyond merely offering meaningless words of condemnation, and the way in which the United States, Britain and other countries went out of their way not to save Jews in the Holocaust – or indeed to save Rwandans, Cambodians and others in subsequent genocides. Barak also used his interview with Israel Hayom to criticize those former Israeli intelligence chiefs and former Prime Minister Ehud Olmert, who have criticized what they argue is Netanyahu’s and Barak’s mishandling of the Iranian threat. Off the record, other former intelligence chiefs have backed Netanyahu’s and Barak’s handling of the Iran issue, and criticized former Mossad chief Meir Dagan and others for speaking out of turn. Tom Gross adds: All this is only speculation and may merely be designed to put pressure on Western countries to become more serious in their diplomatic efforts to pressure Iran. The New York Times published a report by its new Jerusalem bureau chief Jodi Rudoren on May 3 regarding Palestinian prisoners on a hunger strike. Number of quoted words by Palestinian supporters of Palestinian prisoners: 269. Number of words explaining the Israeli rationale behind administrative detention: 0. Number of paragraphs before Rudoren gets around to letting readers know that the stars of her article are members of Islamic Jihad: 14. Countries and groups that list Islamic Jihad as a terrorist organization: U.S., Canada, EU, UK and Australia. Number of other articles in the same edition of the New York Times that use the words “terrorist,” “terrorist organization,” terrorist network” or “terrorist attack” to describe non-Palestinian groups, individuals and attacks: 6. Number of times Rudoren uses these words to describe Islamic Jihad: 0. Number of people murdered by Islamic Jihad: Hundreds. Number of rockets fired at Israeli cities and towns by Islamic Jihad: Hundreds. Number of references in the article to those attacks: 0. Since Hamas seized control of Gaza, there has been a major clampdown on the rights that women, Christians and other minorities enjoyed when Israel controlled Gaza. But last month, 24-year-old Ranad al-Ghozz from Gaza City was allowed to start working as a waitress in a restaurant serving food and drinks to men. She is working at the A-Salam restaurant, located next to the sea. Previously she worked at the restaurant but was only allowed to serve women. Since Hamas seized control of Gaza in 2007, they have passed laws banning women from riding bicycles or from having their hair cut in mixed hair salons, among other restrictions. It remains to be seen whether Hamas will allow al-Ghozz to continue to be employed. Despite rumors to the contrary, Palestinian Prime Minister Salam Fayyad will remain in his position – but without control of the treasury – when Palestinian President Abbas undertakes a major reshuffle of his cabinet in the coming days. Hamas have said they will not form a unity government with Abbas’ Fatah faction unless Fayyad is removed. Fayyad is a Western-educated Palestinian economist who is credited with producing strong economic growth in the West Bank in recent years. Over a decade ago, he won the admiration of the then Israeli Prime Minister Ariel Sharon (who even invited Fayyad to a wedding of a friend near Tel Aviv while the intifada was still continuing). Sharon persuaded then U.S. President George W. Bush to persuade Abbas to appoint Fayyad as Palestinian Finance minister and later Prime Minister. Fayyad is not a member of the ruling Fatah party. The Palestinian finance ministry is expected to be headed by Nabil Qassis, a former president of Birzeit University and currently the head of the Yasser Arafat Foundation. Palestinian Chief Negotiator Saeb Erekat – perhaps the best known Palestinian spokesman in the world, with his regular appearances on international news channels – suffered a mild heart attack yesterday. Erekat, 57, was taken to a hospital in Ramallah where he underwent a catheterization and will remain under observation for about three days. His condition is said to stable. Muhammad Hamida, 10, has been praised in the Tunisian media and by Hamas for his “bravery” after he refused to compete in a chess match against an Israeli child at the World School Chess Championship, which is currently taking place in Romania. In several respects, Tunisia, touted as having the most promising future in the Arab world as a result of the so-called Arab Spring, has become less liberal since the president was overthrown last year. In a rare move, a foreign ambassador – Israel’s Michael Oren – spoke at one of America’s most prominent gay and lesbian events, the Equality Forum in Philadelphia on Saturday. Several Palestinian gay rights organizations, suffering severe persecution in the Palestinian Authority, have recently registered and set up offices in Israel. Contrary to the inaccurate assertions of several leading commentators for respected media outlets like The New York Times and BBC, Israeli Prime Minister Netanyahu has significantly reduced the rate of West Bank Jewish settlement growth during his current term in office. Building on the West Bank was four-times greater in the last Labor government headed by Ehud Barak, and twice as great in the government headed by Kadima’s Ehud Olmert, than it is currently under Netanyahu, according to the IDF. While Western critics wrongly claim that Netanyahu has encouraged the expansion of West Bank homes for Israelis, Jewish settlement leaders and the right-wing of Netanyahu’s own Likud party are furious with him for having made it extremely difficult in recent years to even expand existing apartments in settlements to accommodate growing families. As a result of the reduction in attempted terror attacks launched on Israel from the West Bank, and in an effort to improve the Palestinian quality of life, Israel has speeded up the removal a number of roadblocks on roads throughout the West Bank in recent weeks. Since 2008, the IDF has evacuated 30 manned checkpoints in the West Bank, leaving 11, mostly located at crossings into Israel along Israel’s 1967 borders. “Nowadays, Palestinians can travel from northern Samaria to southern Judea within record time while crossing maybe one checkpoint, when three years ago it might have taken a few hours and they would have had to cross several checkpoints,” an IDF officer told The Jerusalem Post. Israel is also continuing to allow Palestinian battalions to train in Jordan. Eight battalions have already deployed in the West Bank, comprising about 4,000 policemen trained by the United States. This is a follow up to the third item in the dispatch: London 2012 Olympics official website: Jerusalem Capital of ‘Palestine,’ not Israel. Palestinian Authority President Mahmoud Abbas has bowed to domestic and international pressure and reduced the number of Internet and print media outlets critical of Abbas’ rule which are being censored. In recent weeks, there has been a stepped-up clampdown on journalists and bloggers in the West Bank, and Palestinian security forces have arrested at least nine Palestinian journalists. They had criticized the siphoning off of huge amounts of international aid money into private bank accounts held by those close to Abbas and his sons. The biggest clampdown by Palestinian security forces in the West Bank for years has been launched, after unidentified men shot at the home of Jenin Governor Kadoura Musa last Wednesday, causing him to then die of a heart attack. Palestinian Authority security forces have arrested dozens of Palestinians in Jenin and the surrounding villages. Many of those arrested are Fatah members and officers working for PA security services. Palestinian media said at least 2,000 PA policemen and officers were taking part in the operation. Among those arrested is Zakariya Zubeidi, the commander of Fatah’s armed militia, the Aqsa Martyrs Brigades, in Jenin; and Muhammad al-Zalafi, the former security commander of Jenin. All the suspects have been transferred to the PA’s central prison in Jericho. Jenin residents welcomed the crackdown. For months, they have been complaining about lawlessness in the city. Many residents blame Fatah gangs for the chaos and involvement in crimes, including extortion and murder. Last year, unidentified men shot and killed Israeli Arab actor and producer Julian Mar-Khamis as he walked through Jenin. Musa had been trying to restrain Fatah gangs in the town. A German toy company has apologized after it sent an email to a client in Tel Aviv calling Jews “a disease” and praising “the great” German poet Günter Grass for his demonization of Israel. Several emails by The Jerusalem Post sent to Hoff-Interieur went unanswered, but the company eventually apologized yesterday after a story by the Post was reproduced in a number of German newspapers. Iran has already sent several small animals – including a rat, turtles and worms – into space. Below is a report from Iran’s official Fars news agency. TEHRAN (FNA) - Iran will send more living creatures into the space by the next three months, a senior Iranian space official announced. “Given the good support that has been offered by the government, we will have a program for sending living creatures into space,” Head of the Iranian Space Agency Hamid Fazeli said. “The preliminary steps have already been taken and the living creatures will be sent into the space by the next two or three months,” Fazeli added. He further announced that Iran will send Fajr (Dawn), Tolou (Sunrise) and Elm-o Sana’at (Promise of Science and Industry) satellites into orbit this year. Iran has already sent small animals into space - a rat, turtles and worms - aboard a capsule carried by its Kavoshgar-3 rocket in 2010. The Islamic republic, which first put a satellite into orbit in 2009, has outlined an ambitious space program and has, thus far, made giant progress in the field despite western sanctions and pressures against its advancement. A screenshot from the official website of the 2012 London Olympics as it appeared until this morning. It has now been corrected following complaints. Officials in Jerusalem have clarified remarks made by Israeli Prime Minister Benjamin Netanyahu in a CNN interview last week in which he expressed a seeming willingness for Palestinian contiguity. They explained Netanyahu was referring to the West Bank, and not necessarily advocating a physical link between the West Bank and Gaza that would cut across Israel. Netanyahu said “yes,” but was then cut off before he could elaborate. Prime Minister Netanyahu’s father Benzion Netanyahu, a leading historian and prominent activist during the creation of the modern state of Israel, died this morning at his Jerusalem home at the age of 102. He was a leading expert in Medieval Spanish Jewry and professor emeritus at Cornell University and editor of the prestigious Encyclopedia Hebraica. Besides the current Israeli Prime Minister, Benzion Netanyahu had two other sons: Yonatan, born in 1946, a former special forces commander, who was killed in 1976 during the operation to free kidnapped airline passengers at Entebbe; and Ido, born in 1952, a physician, author and playwright. Leading Palestinian spokeswoman Hanan Ashwari, a member of the PLO Executive Committee, has become the latest senior Palestinian to strongly criticize Palestinian Authority President Mahmoud Abbas for his increasing clampdown on media freedom. I have previously reported in these dispatches in recent months about the violent harassment and detention of Palestinian journalists, bloggers and a cartoonist who dared to write about the endemic corruption and human rights abuses of Abbas’s Western-backed Palestinian Authority. Last week, several Palestinian political websites were shut down by the public prosecutor Ahmed al-Mughni. The Palestinian Minister of Communications, Mashhour Abu Daka, then submitted his resignation after denouncing the censorship of these sites by al-Mughni. “Several Palestinian officials have expressed reservations about the decision, calling it embarrassing and counterproductive,” the news agency said. Many Israeli Arabs have been dissatisfied with the often harsh anti-Israel positions of the existing Israeli-Arab political parties, not to mention the support some of the leaders of these parties have voiced for Syrian dictator Assad, former Libyan dictator Gaddafi, and the Islamic militia/terror groups Hamas and Hizbullah. Tentatively called the Israeli-Arab Nationalist Party, it will field candidates in the next Israeli general election – in a country denounced as an “Apartheid state” by anti-Israeli activists such as former American president Jimmy Carter and various Ivy League university professors. Sarhan Bader said he would fight to improve the position of Arabs in Israel (they make up 22 percent of Israel’s population). He said his party would represent its constituency better than the current Arab parties, in part because he intends to join the coalition, which no Arab party has ever done. There is much speculation in Israel this week that early elections may be called. Elections are not scheduled until late next year. According to recent polls, Benjamin Netanyahu’s Likud party would garner twice as many votes as any other individual party but under Israel’s complex proportional representation system it would still require the support of several other parties to form a coalition. 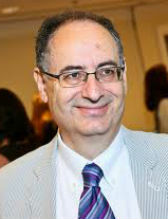 Hebrew Literature Professor Naim Araidi, who is an Israeli Druze, has been appointed Israel’s ambassador to New Zealand by Israeli Foreign Minister Avigdor Lieberman. “After years of representing the State of Israel unofficially, it will be a great privilege for me to do so in an official capacity and show Israel’s beautiful side, as well as the coexistence that despite all the hardships can only be maintained in a true democracy,” Araidi told Israel’s most popular paper, Yediot Ahronot. Born in Kfar Marrar in the Galilee, the 62-year-old Araidi teaches at Haifa University and at Bar-Ilan University. In 2008, he won the Prime Minister’s Award for Hebrew Literature. He received his doctorate in Hebrew literature from Bar-Ilan. His poems have been published in more than a dozen languages. Lieberman is often wrongly portrayed by Western media correspondents and commentators as not caring about Arabs, but he has in fact promoted quite a number of Israeli Arabs and Druze to various positions during his term as foreign minister. Several Arabs and Druze are working at various Israeli embassies in various capacities. Among Druze ambassadors for Israel are Walid Mansour, who was posted to Vietnam and Reda Mansour who served in Ecuador. Several high-profile figures in the Arab world have recently visited Jerusalem and prayed privately at the Al-Aqsa mosque, which many Islamic scholars say is the third holiest site in Islam after Mecca and Medina. These visitors, including Jordanian Prince Hashim and Prince Ghazi Bin Muhammad, Egypt’s Grand Mufti Ali Gomaa and Jordanian intelligence official Hussein al-Majali, have been strongly criticized for doing so. Many Islamists have been angered, arguing that they have in effect granted legitimacy to Israeli control of the city. However, Palestinian Authority President Abbas has now said that such visits are to be welcomed and they should not be seen as acceptance of Israeli control over the eastern part of the city. The argument by some leading Islamic scholars that going to the al-Aqsa mosque is forbidden as long as access is controlled by Israelis is wrong, Abbas said. Their trips to Jerusalem were coordinated with Israel. Access to al-Aqsa is guarded by Israel security forces, which protect all of Jerusalem’s holy sites but have granted open access to people of all faiths. This was not the case before 1967, when the Jordanian occupying army refused Jews access and destroyed a number of ancient synagogues and the gravestones of prominent rabbis in and around Jerusalem’s old city. Jews and Christians call the al-Aqsa compound the Temple Mount. It is the site of the Biblical Temple, destroyed by Roman troops in the 1st century. The surviving foundations of its Western Wall are now a focus of prayer for Jews around the world. For Muslims, who captured Jerusalem from the Christian Byzantines in the 7th century, the Dome of the Rock marks the spot from which the Prophet Mohammed is said to have made a night journey to heaven. Islamist leaders in Gaza have urged “all armed factions” to kidnap Israeli soldiers and use them as bargaining chips to free the remaining convicted Palestinian terrorists in Israeli prisons. Last year, Israel freed over 1,000 Palestinians, including many responsible for murdering hundreds of Israeli civilians in terror attacks on buses and cafes, in return for the release of Gilad Shalit, a teenage soldier seized inside Israel in 2006 and held by the Islamist group Hamas in secret captivity in Gaza for five years. Two Palestinian youths armed with pipe bombs were apprehended by Israeli security forces as they tried to make their way to Jerusalem. The pair, both aged 17 and from Nablus, took a taxi to the Tapuach checkpoint. After stopping the pair, who were acting suspiciously, Israeli border guards found five pipe bombs, a gun and ammunition in a backpack. The pair admitted they were planning to plant the bombs in crowded places in Israel. Residents of the Israeli coastal city of Ashkelon were forced to interrupt Independence Day celebrations last week when air raid sirens sounded. At least one rocket fired from the Gaza Strip exploded but caused no injuries or damage. On the day before Independence Day, Israelis mourned the 126 security personnel who died in service for Israel during the past year. In total, 22,993 servicemen and women have died defending Israel in the modern era. The Internet search engine Google donned blue and white Israeli flags for some users to mark the Jewish state’s 64th birthday last week. Users of Google with some Israeli and American IP addresses saw the special decorations adorning the image of the company’s name when it appeared on the search engine’s homepage last Thursday. The modified logo is known as a “doodle,” and Google often uses different versions for special occasions. Google was founded by Russian-born Jew Sergey Brin, who has several relatives in Israel. In a surprise move, the Gazan education minister Ziad Thabit, a supporter of Hamas, has suggested that 10th and 11th grade students in Gaza learn Hebrew in the 2013 school year. According to the Palestinian Ma’an news agency, the Hebrew courses are part of a wider move to introduce foreign languages into the school curriculum. Turkish is also being considered. There are many Hebrew-speakers in the Gaza Strip – the result of many Palestinians working in Israel until the Oslo Peace Accords led to a worsening of relations between Israelis and Palestinians. Europe’s largest gay news service, Pink News, reports that a man, identified only as Ch. M., was hanged by Iran in Marvdasht, Fars province, on April 19 for alleged homosexual activity. The Iranian regime has increased persecution of gays and lesbians in recent years. In the past, human rights activists, gay journalists, and gay publications such as “Queerty” have criticized Human Rights Watch and other leading self-styled Western human rights groups for failing to focus on the rise of persecution of gays in Iran. Other critics have said that HRW has been so obsessed with attacking Israel (HRW was the lead promoter of the now disgraced Goldstone report, for example) that it turned a blind eye to many terrible human rights situations throughout the Middle East, although more recently following intense and sustained criticism (including on this dispatch list), HRW has reported on the persecution of gays in Muslim countries. Saudi Arabia recalled its ambassador from Cairo on Saturday “for consultations” and closed its embassy and consulates in Egypt “for security reasons”. This followed protests against the kingdom’s arrest of an Egyptian lawyer, who has been sentenced to a year in prison and 20 lashes for allegedly insulting Saudi King Abdullah. It was the first public rupture between the two major Arab states since last year’s popular uprising in Egypt that forced Hosni Mubarak, a close ally of the Saudi regime, from power. On Friday around 1,000 protesters demonstrated outside the Saudi embassy in Cairo, demanding the release of the lawyer and other Egyptians held in Saudi jails. Some of them showed their anger by removing their shoes and waving them at the building – a gesture regarded as highly insulting in Islamic culture. At least 500 Syrians have been killed by Assad’s forces and hundreds more injured, since a supposed ceasefire negotiated between Kofi Anan and the Assad regime went into effect on April 12. Syrian activists have reported at least 25 more deaths at the hands of Syrian army forces yesterday. Following protests, the website has been changed to show Jerusalem as the capital of Israel as well. Unlike dozens of other disputed territories throughout the world, such as Tibet, Kurdistan or Balochistan, Palestine is invited to participate in the Olympics as if it were already a nation state. UPDATE, May 2, 2012: Following the controversy on Monday, the Olympic website appears to have removed all capital cities. It is also peculiar that Israel is listed as a “European” country, but Palestine is listed as an “Asian” country. This dispatch contains recent news items connected to anti-Semitism. For space reasons, I omitted other recent anti-Semitic attacks elsewhere. But at the same time I would like to emphasize that while anti-Semitism is once again a rising phenomenon in many countries, elsewhere Jews are living free from harassment. There will be a dispatch dealing with political items from the Middle East later today. Majeda El Batsh, the Israeli-Arab affairs correspondent of the French news agency Agence France Presse (AFP) reports from the town of Umm El-Fahm in northern Israel that for more than five decades, Leila Jabarin hid her secret from her Muslim children and grandchildren – that she was a Jewish Holocaust survivor born in the Auschwitz death camp. Last week just before Israel’s annual Yom HaShoah (Holocaust Remembrance Day) Jabarin, who was born Helen Leah Brashatsky, finally sat down and told them the truth. A child survivor of Auschwitz, she arrived in a ship carrying other Jewish survivors from Yugoslavia, which was forced to anchor off the coast of Haifa for a week due to a heavy British bombardment of the northern port city, which killed other Holocaust survivors. Her mother, who was from Hungary, and her father, who was of Russian descent, were living in Yugoslavia when they were sent to the Auschwitz with their two young sons in 1941. Born in Auschwitz she was saved by a non-Jewish doctor there who hid her for three years under the floor of his house inside the camp. Her mother worked as a maid at the doctor’s home. Aged 17 in Israel, Helen Brashatsky eloped with a young Israeli Arab man called Ahmed Jabarin, and they moved to live in Umm al-Fahm. Jabarin, who dresses in a hijab and long robes, but has pale skin and blue eyes typical of Ashkenazi Jews, then converted to Islam, but didn’t tell her family the full extent of her history until last week. For her family, the revelation was a huge shock – but it answered a lot of questions, admits her 33-year-old son Nader Jabarin. “Mom used to cry on Holocaust Memorial Day watching all the ceremonies on Israeli television. We never understood why. We all used to get out of the way and leave her alone in the house,” he told AFP. In countries like Poland and elsewhere, it has been a relatively common phenomena for Holocaust survivors to hide their origins, so traumatized were they by their persecution. Former U.S. Secretary of State Madeleine Albright has written a new memoir in which she finally comes clean about her Jewish roots. The book, “Prague Winter: A Personal Story of Remembrance and War, 1937-1948” is set to be released this week, and says that between 1942 and 1944, at least 25 members of her family were herded into the Terezin (Theresienstadt) concentration camp north of Prague by the invading Nazis. None survived. Albright, originally named Marie Jana Korbelova, left Czechoslovakia for England in 1939, when she was 2 years old, and grew up Catholic, and later Episcopalian. A New Jersey appeals court has ruled that a man who says he endured anti-Semitic slurs can sue his former supervisors even though he is not Jewish, reports The Washington Post. Myron Cowher, a former truck driver for Carson & Roberts Site Construction & Engineering Inc., in Lafayette, N.J., sued the company and three supervisors after he allegedly was the target of anti-Semitic remarks for more than a year. Cowher, of Dingmans Ferry, Pa., produced DVDs that showed supervisors Jay Unangst and Nick Gingerelli making such comments in his presence as “Only a Jew would argue over his hours” and “If you were a German, we would burn you in the oven,” according to a state appeals court ruling handed down April 18. Cowher has a German-Irish and Lutheran background and is not Jewish, but said he suffered as a result of a campaign of anti-Semitic abuse. The appeals court did not consider the merits of Cowher’s case, but only whether he has standing to pursue it. The suit, alleging discrimination that created a hostile work environment, had been dismissed by a Superior Court judge who ruled that because Cowher was not a Jew, he could not sue. But this was overturned by the appeals court which ruled he could now go ahead with the case. Employment attorneys say the ruling is significant since it expands the scope of who can bring discrimination suits under the state law by allowing a person who is not actually a member of a protected class to pursue a claim. A hospital in Brussels has fired one of its top surgeons for hurling Nazi slogans and racial slurs at a Jewish colleague. The surgeon called out “sieg heil,” and told his younger Dutch-born, Jewish subordinate to “head back into the gas chambers,” according to a complaint which the Jewish doctor (who wishes to remain anonymous) filed with the Brussels-based Center for Equal Opportunities, an anti-discrimination watchdog organization. “It’s a pity because he was a good surgeon but his statements do not conform to the hospital’s mission,” Edgard Eeckman, the spokesman for the Universitair Ziekenhuis Brussels hospital, told the newspaper De Morgen. Hospital authorities identified the surgeon as Dr. Frank H., and added that he was “difficult,” and had been subject of a previous complaint against him for alleged violent and racist behavior in July. The young Ukrainian Jewish man who was viciously attacked and left for dead after leaving a Passover Seder at a synagogue in Kiev earlier in April has now regained consciousness at a hospital in Israel. Aharon Alexander Goncharov, 25, regained consciousness last week, despite fears by doctors that he would never wake up and would be left in a coma or with severe brain damaged. “The fact he is awake and not brain damaged is a miracle,” Itzhak Shapira, the director of the Sourasky Rehabilitation Center at Tel Aviv’s Ichilov Hospital, told the newspaper Israel Hayom. Goncharov, who wears a skullcap, said his attackers yelled “Yid” as they hit him with glass bottles on his head, Israel Hayom reported. Two days after the attack, he was flown, still unconscious, to Israel on the private plane of a Ukrainian-Jewish businessman, and admitted to Ichilov, one of the world’s leading hospitals. The Israeli government has covered the cost of his treatment and the rehabilitation which he will now undergo. Goncharov told Israel Hayom that he has no plans to remove his skullcap when he returns to Ukraine after completing his course of rehabilitation. The head of Australia’s Catholic Church, Cardinal George Pell, has apologized for what Jewish leaders described as “deeply problematic” comments he made about Jews on a TV show. During a TV debate on April 10 with the British atheist Richard Dawkins on “Q&A,” a leading current affairs talk show on the Australian Broadcasting Corp., Cardinal Pell said that Germans suffered more than Jews during the Holocaust. Earlier in the debate Pell said that “the little Jewish people” were shepherds who were morally and intellectually inferior to the ancient Egyptians. The Catholic Church has a centuries’ long history of anti-Semitism, and Catholic priests in Slovakia, Croatia and elsewhere were at the forefront of rounding up Jews and sending them to death camps during the Holocaust. The Montreal Gazette reported (on April 16) that vandals broke into and defaced about 15 Jewish-owned summer homes in Val David, Canada. In one home, at least one of the vandals defecated on the floor, said Pinkas Feferkorn, director of the Val Morin synagogue. In other homes, anti-Jewish hate messages such as “F--k Juif” and large swastikas were spray-painted all over the walls outside and inside the homes. Furniture was damaged, and clothes and toys were thrown out of windows. The Quebec police are investigating the break-ins in Val Morin, which lies 90 kilometers northwest of Montreal. No one was in the homes during the incidents. Joel Weber, whose cottage was ransacked, said the vandals also apparently tried to start two fires – one in the middle of a street and another on a tarp covering a community swimming pool. There have been attacks on the Jewish community in the town before. In 2005, vandals broke into a Val Morin synagogue and desecrated 300 holy books. In nearby Val David, several suspicious fires were started in 2007, including some in a neighborhood where about 50 orthodox Jewish families own cottages. A year later, a Hasidic Jewish tourist was punched in the face as he walked to a synagogue in nearby Ste. Agathe, reported The Montreal Gazette. The (London) Daily Telegraph reports that large quantities of football (soccer) merchandise with anti-Semitic slogans and calls for attacks on visiting fans have been put on sale in Poland just weeks before hundreds of thousands of football fans descend on the country for the 2012 European championships. At one outlet in the shadow of the stadium belonging to Widzew Lodz, one of Poland’s biggest clubs, fans can buy scarves and stickers with the motto “Jews forbidden,” notes The Daily Telegraph. Anti-racism campaigners also claim that “To My Kibice,” a popular fan magazine sold in high-street shops, often carries advertisements for racist and xenophobic material. The availability and apparent popularity of the products have fuelled fears of outbreaks of racism and violence during Euro 2012, which starts in June and is co-hosted by Poland and Ukraine. Last year, fans of the Polish team Legia Warszawa drew international condemnation when they unfurled a massive banner during a European match against Hapoel Tel Aviv bearing the slogan “Jihad Legia” written in Arabic style writing. After decades of controversy, the city authorities in the Austrian capital Vienna have renamed a stretch of the Vienna ring road named after the city’s former mayor Karl Lueger (1844-1910), an anti-Semitic populist who was idolized by a young Adolf Hitler when he lived in Vienna. The ‘Dr.-Karl-Lueger-Ring’, which passes in front of the University of Vienna’s main building, will in future be called ‘Universitätsring,’ a city official confirmed to the Austrian news agency APA. The decision was taken at the request of Vienna University. “Lueger is widely regarded as the founder of modern anti-Semitism and was a fantastic inspiration for Hitler,” Social Democratic city official Andreas Mailath-Pokorny said. A monument in honor of Lueger will remain on the boulevard, however. Hitler was a resident of Vienna from 1907 to 1913, and Lueger, who regularly whipped up anti-Semitic fervor, was mayor during some of this period. In a meeting on April 24 in the town hall of the southern Swedish city of Malmo, Hannah Rosenthal, the United States special envoy to monitor and combat anti-Semitism, accused the controversial Malmo mayor, Ilmar Reepalu, of not doing nearly enough to prevent rampant anti-Semitism. In March, Reepalu told a Swedish magazine that the anti-immigrant, anti-Muslim Swedish Democratic Party had “infiltrated” the city’s Jewish community to turn it against Muslims. Reepalu later apologized to the Jewish community, acknowledging that this was completely untrue. Reepalu also angered the Jewish community when he said it bore responsibility for attacks upon it because the community has not condemned Israel. Only 760 registered Jews remain in Malmo, others having left the city in recent years following a series of assaults. Malmo’s only remaining rabbi, Shneur Kesselman, said he has been the victim of more than 50 anti-Semitic incidents during his eight years in Malmo. Kathrin Dominique, a congregant at Malmo’s 109-year-old synagogue told Rosenthal that her teenage sons have been harassed repeatedly, mainly by Muslim youths. Malmo now has a Muslim population of around 50,000, one sixth of the city’s population. Muhammad Abu Shahala, who worked for the Palestinian Authority reportedly confessed under torture to selling his home in Hebron on the West Bank to a Jewish man.